← What are we expecting to WOW us at EGX later this month? When will Samsung pay make it to the UK? Back in July we spoke about Apple pay and many of us with iPhone 6 devices are using it. It’s even accepted in the canteen here at Pinewood Studios. Yesterday the US got Samsung Pay, the first of the android device range to be given access to ‘true’ mobile payments and earlier in the month Samsung confirmed it had extended its longstanding partnership with Mastercard across Europe – but when will the UK actually get Samsung Pay and will we have to ensure our individual network provider allows it? (The news from the US is only certain carriers are accepting the T&C’s for Samsung Pay). It’s slightly different to Apple Pay in the way that it’s actually much more compatible with regular payment terminals. Samsung Pay combines NFC and a new MST (Magnetic Secure Transaction) technology which makes it a universal solution that is compatible with both NFC terminals and the more traditional magstripe devices – used for debit and credit card transactions. Samsung says this means the payment service could be accepted at 30 million merchant locations worldwide. 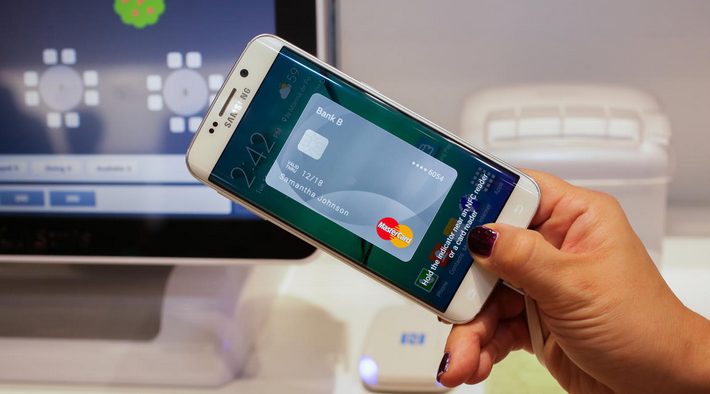 Samsung pay will be available for the Samsung Galaxy S6, S6 edge and S6 Plus handsets, but will also work with the Samsung Gear A smartwatch and the Galaxy Note 5 tablet. So, what we do know is what devices it works with and how it works, but we just don’t know when we can have it. Samsung is tight lipped simply saying ‘in the near future’. Does this mean 2015 or 2016? We’re a savvy boutique team of brand and communication consultants working across consumer and B2B markets. We deliver strategic and creative PR campaigns that get our clients noticed no matter who they are – from start-ups to major global corporations. Posted on September 30, 2015, in Uncategorized. Bookmark the permalink. Leave a comment. What are we expecting to WOW us at EGX later this month?